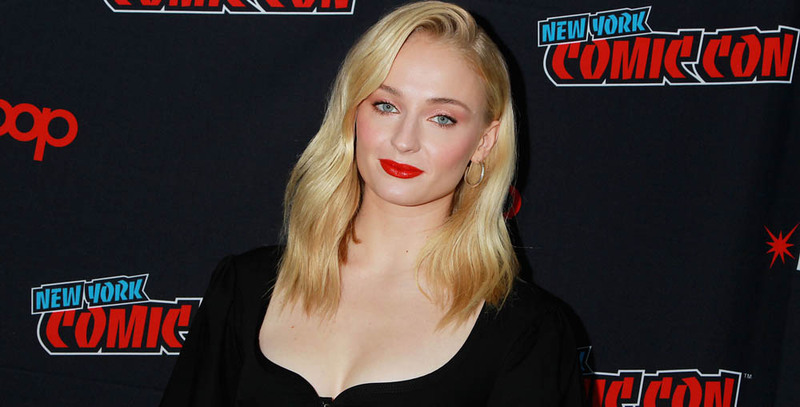 Sophie Turner was at the New York Comic Con presenting and promoting her new movie, ‘Dark Phoenix’. I have added some photos and more are coming! Go to the gallery and enjoy! Sophie Turner attends the Louis Vuitton show as part of the Paris Fashion Week Womenswear Spring/Summer 2019 on October 2, 2018 in Paris. You can go to the gallery to take a look to the photos. Sophie Turner attends Louis Vuitton 2019 Cruise Collection at Fondation Maeght on May 28, 2018 in Saint-Paul-De-Vence, France. I have added some photos to the gallery so, go there to take a look. Sophie Turner may be in the middle of filming Game of Thrones’ highly secretive final season, but the British actress who plays Sansa Stark is never too busy to talk hair shop. And while Turner, 22, is known for her fiery auburn locks, as Wella Professional’s latest ambassador, the now platinum blonde proves that she can work just about any color. From her must-have hair products to her militant moisturizing, here, Turner reveals her best-kept beauty secrets. Charlotte Tilbury Magic Eye Rescue Cream, Graydon Face Food Mineral Mist Toner, Egyptian Magic Face Cream, Charlotte Tilbury Magic Night Cream, and micellar water. Good eating! And washing your face with micellar water every day, followed by toner. Moisturize, moisturize, moisturize. I live in the U.K.; it can get very dry. Dior Diorshow Mascara and Tom Ford eyeshadow. Charlotte Tilbury Hollywood Beauty Light Wand ( $38, bloomingdales.com). Some spoilers for Josie below. You’d be forgiven for failing to recognize Sophie Turner when she first appears in Josie. She’s blonde, for one, ditching the red hair that she’s famous for as Game of Thrones’s Sansa, she’s sporting multiple tattoos, and she’s got a Southern drawl that places her miles away from Westeros. “This is one of the most transformative roles I think I’ve done so far,” Sophie Turner says of Josie, a young woman who turns a sleepy Southern town on its head when it seems that her relationship with an older man (Dylan McDermott) may be more than just platonic. But don’t let appearances fool you: In Josie, much like in Game of Thrones, nobody’s quite who they say they are. Before the movie’s March 16 release, Vulture caught up with Turner to talk about the ins and outs of learning an accent for the film, method acting, and why she’d love to do a comedy. Without spoiling anything, I’m curious to know how this movie was pitched to you, because it has so many layers to it. Did they tell you the whole story straight off the bat, or did you read the script first? I was pretty much sent the script straight away — there was no real pitching. I knew the references that Eric [England], the director, had for me were like Killer Joe and True Romance, so I kind of brushed up on those movies. I read the script, watched the movies, and then I implemented a little bit of Alabama Worley in True Romance into it, and obviously the Killer Joe part. When I spoke to Eric after I read the script, he wanted it to not even give any real hint of a thriller until the very end. We wanted it to be light and bright, and have Josie be this beacon of fun and laughter and light. The movie also reminded me a lot of Ellen Page’s Hard Candy, insomuch as it features this young woman who’s really weaponized her sexuality. Was there anything that you were kind of wary of in playing this part, particularly because of how young the character’s supposed to be? Not really, because that’s kind of the whole point of the character. She has to be young and it has to be questionable. It has to be incredibly intriguing that this young girl is so sure of herself, owning her sexuality and completely independent. That’s the alluring thing about her for [McDermott’s character] Hank. There was really no discussion about aging her up or anything, because it felt like it had to be that. Also, actually, the real Josie — obviously “Josie” is this facade that this girl has put on — I think we discussed that her real age was 21, and pretending to be 17. So it was all part of the plan. What were the conversations like during filming between you and the director, as well as with Dylan McDermott? Dylan was in character pretty much from the get-go. He went pretty method, actually. It was really, really interesting to see; I’ve never worked with someone who’d kind of gone method before. But going around to his house and having rehearsal, he would have it set up, like, he would be playing country music, and he would open the door and he would have his boots on, and he would talk in a Southern accent. He was 100 percent committed to the role. We would have rehearsals, and Eric and I would talk about the script, but honestly, that was the most interesting thing for me. He would be in his trailer smoking cigars, listening to country music. It was fascinating. Sophie Turner attends the Louis Vuitton show as part of the Paris Fashion Week Womenswear Fall/Winter 2018/2019 on March 6, 2018 in Paris. Some photos have been added to the gallery, please, credit this site if you take the pics.